So crossing theVietnam Cambodia boarder is fun. We decided to get a bus from Ho Chi Minh to Phnom Penh. We thought this would be the easiest way to cross as the bus should go straight through with no changes. We are told the journey is 7 hours long taking in time to cross the boarder and go through passport control. 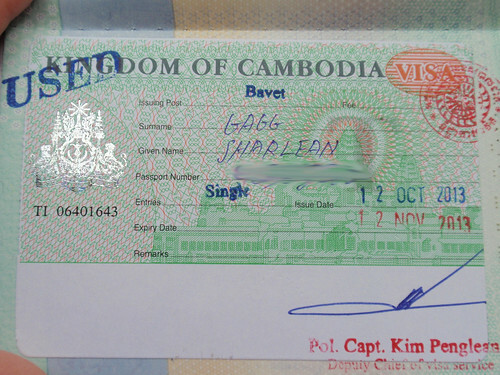 So when an hour passes and our “guide” asks everyone for their passports and $25 (£15) were a little surprised. It feels very strange handing someone your passport but everyone is doing it even locals. Two hours later and we arrive at the Vietnam boarder only this isn't announced, the bus just stops and everyone gets off with the man holding our passports disappearing. We see a mass of people around 4 passport booths so along with the other foreigners we head towards the crowd all asking each other what's happening. Then guys at the booths start shouting out names and passing passport back over the heads of everyone waiting. Hearing our names we grab our passports and walk confused through the boarder to find our guide at the exit who then takes our passports back. Once back on the bus we go literally seconds down the road (we could have walked) and are all told to get off. This time watching our guide like a hawk we are ushered through a room and told to sit down. One by one we're called, given our passports and get to go through passport control with a slip in our passports. This is unexpected sophistication we are asked to digitally scan our finger prints and look into a camera for our mug shot. Passports stamped get to board our bus and keep our passports. We are now in Cambodia!